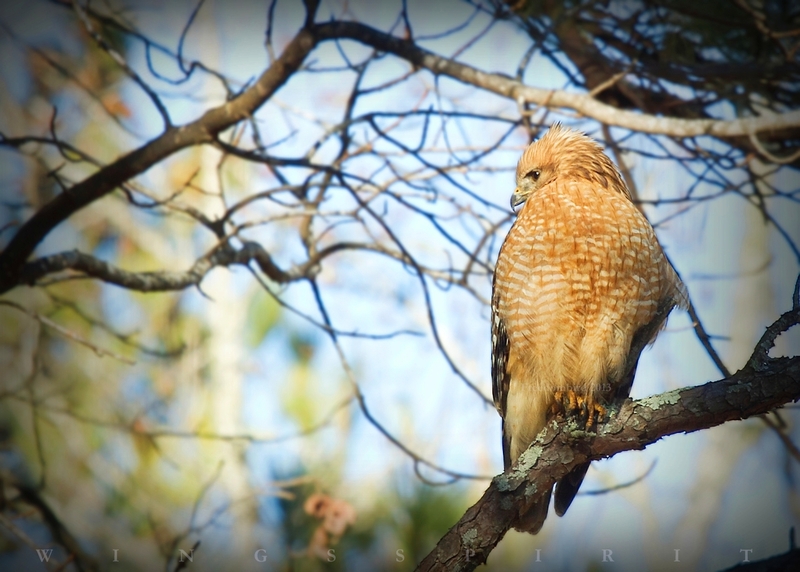 A pair of Red-shouldered Hawks (Buteo linertus) are regular visitors to my backyard forest. I caught this shot while refilling my bird feeders. Red-shouldered Hawk mainly hunts small mammals, mice, amphibians and reptiles. In the past, I made a short video of this hawk caught his dinner. If you missed that video, just follow this link to revisit it Red-shouldered Hawk and his prey. You might be wondering why I have so many birds in my backyard. The answer is simple, be a tree huger! Love trees and grow a lot of trees. With various types of trees around your premises, not only do you help to conserve green environment, you provide three most important factors, food, nesting and roosting ground for any bird to survive. Trees are beneficial to all living things, they clean up air, they provide shade, they produce flowers, fruits and even seeds. I agree that diseased trees might need to be taken down if they are too close to your home. But do you know snags (diseased or dying trees) sometimes doing more good than healthy trees! Cavity nesters such as woodpeckers and nuthatches use snags as nests. Pileated Woodpecker only uses a standing, dead tree to excavate their nest. Since they will not reuse their nests, old nests become other smaller birds' nesting and roosting holes! No wonder, Pileated Woodpecker is to be known as the Ecosystem Engineer!